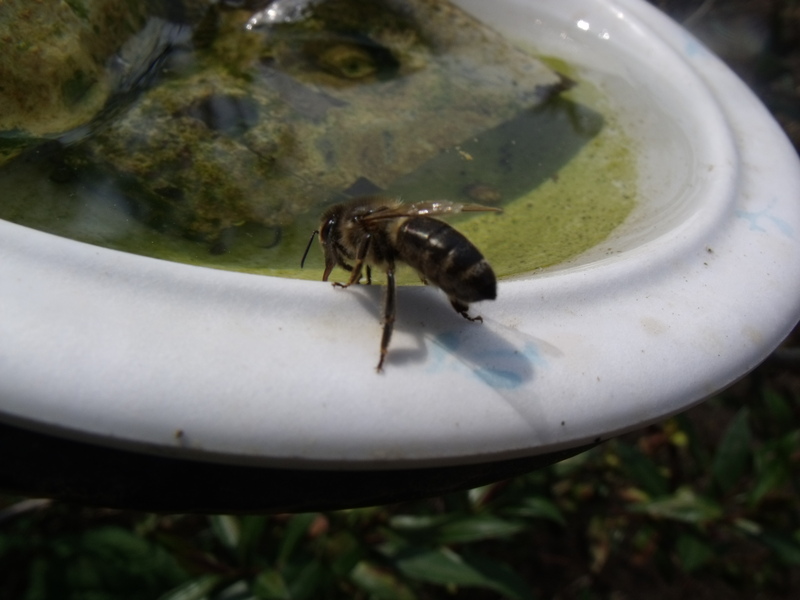 When the phone rang tonight and Mike said he had a swarm – had I got a hive ready – I was temporarily disorientated – not helped by the poor mobile reception inside my house. My all in one suit was in the wash and I needed to strim near the second hive as I’d had to avoid walking across the newly seeded lawn too often to get down to the apiary so I started sorting everything out. I had thought Mike would want me to get the swarm but he’d been dealing with it earlier in the day and was about to go back – hoping it was still there – and his idea was that he would collect and just continue round to my house. I’d caught a few moments of an interview with Elton John earlier in which he mentioned getting the call that the surrogate mother of his child had gone into labour. He’d probably think it an insult but I couldn’t help feeling a similar excitement. It was dusk as Mike arrived and there were a few loose bees and a cluster around part of the outside of the box so we edged down the garden and shook the main collection of bees into the hive. We could hardly see so I went and got a torch. The prepared hive had the removable board in the base and about 5 brood frames topped by the usual Queen excluder, crown board and roof. I should perhaps have added a queen excluder at the bottom but as I had not done so Mike suggested I could do so early in the morning when hopefully they would have moved upwards a little. We did manage to see an encouraging fan of the tail enders ascending the alighting board and going through the reduced entrance. We were trying to check that we had not inadvertently left her majesty in the box. This swarm had come from a local school; as the boarders returned to this state school to-day the swarm was spotted on the playing fields. Strangely I live very close to another boarding school. I read recently that if your own hive swarms it does not matter if you break the normal rule of moving them either less than 3 feet or more than 3 miles. Once they have swarmed they only become attached to a location when they have started to build comb and the act of building comb is a sign they have started to settle. When they swarm they are in a state that they build comb quite rapidly. I’ll try and take some photos tomorrow. Wednesday morning at 5 am I added a QE underneath the brood box. If the queen is not mated that will cause problems if left for long. 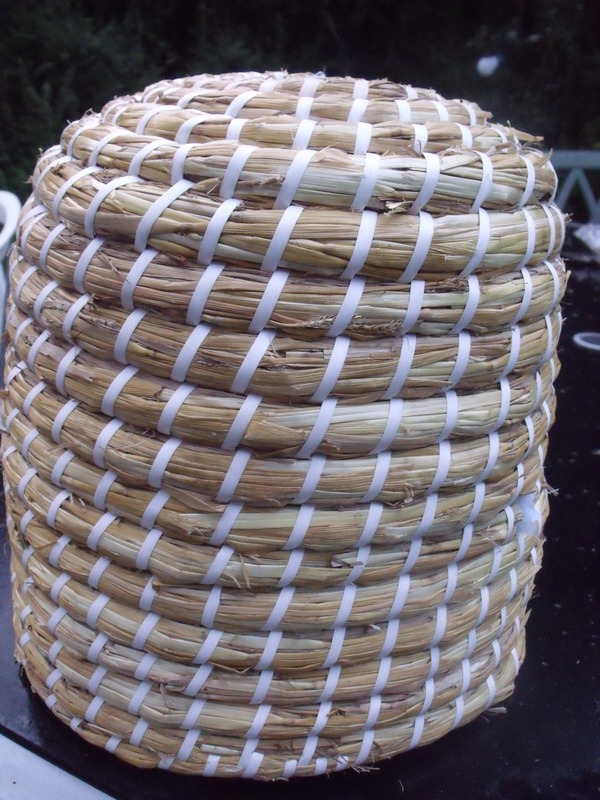 I also added a photo which really is a cheat – this swarm saw nothing of a skep as they were inside a very suitable box but some of you might like to see a photo of a skep? I had wanted one if only for artwork associated with bees but those I found were so expensive – then I read about recommendations for www.vectis-apiculture.co.uk and the price was so much better at a special offer of about £16. The new bees seemed to have stayed the night at least. I had put about 5 frames in there but I note that books advise they are so keen to build comb at this stage it is better to fill the box and if there is any drawn out comb so much the better. Another visit scheduled. And I need to start a record sheet in my apiary spreadsheet for them. The extra tasks are somewhat at odds with other advice which is to leave them alone for a week. It rained overnight so I think the extra moisture may help – it had been veery dry though there are plenty of water sources near the hives. Despite that one of the favourites is a bird bath.